La Calma is the European Centre for Paramita Path® teachings, an international organisation dedicated to meditation, healing and spiritual development. This allows us to offer you a variety of Workshops and Processes that will help you open your heart, connect with your divine essence of Pure Love and discover your mission in this life. in this spiritual journey you learn how Love is our only purpose and that our mission is to be an instrument of this Pure Love. You will be guided through an unconditional love experience that will transform your life. 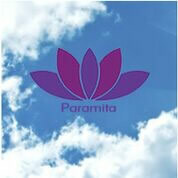 The Paramita® workshops, meditations and special processes will help you open your heart to the light of Pure Love. Once you are within your spiritual heart you will be able to feel your divine essence and the true purpose of your life. It is in your heart that you are able to know with absolute certainty , which is your mission and if you are fulfilling it or not. It is whilst being in your heart that you will also be able to enjoy a deep and sublime peace, serenity and joy. You will be able to connect with your divine essence and light the flame of enlightenment which is in your heart. With this beautiful awakening you will become One with All. 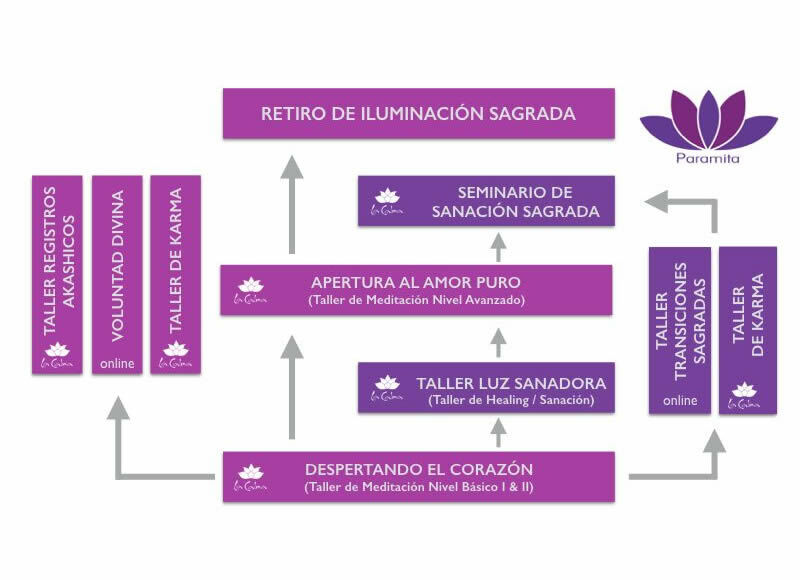 Paramita® offers you two branches within its spiritual development programme, a Meditation path (shown in pink) and a Healing path (shown in purple). In the diagram you will be able to see the workshops that you will be able to do at La Calma or complete online in order to prepare for the Sacred Enlightenment Retreat or the Sacred Healing Seminar which are offered in North Carolina with our teacher Alba Ambert. In this workshop (which can be offered in two levels) you will be guided to open your spiritual heart so that you can live a peaceful life filled with joy and harmony. You will also learn how meditate from within your heart and connect to the universal energies in order to give yourself healing. Your Kundalini energy will also awaken and you will begin a process of opening your heart and connecting, through your heart, to the Light of Pure Love. You will receive an attunement that opens and activates the sacred space of your heart in order to be able to feel Pure Love in all of your being. This will allow you to connect with the deepest part of your being and be able to radiate Pure Love energy from your heart outwards. You will also learn how to receive answers to your questions directly from your heart instead of the mind. You develop a profound understanding of who you are, understand the many traps of the ego, its shadows and how to liberate yourself from your ego´s behavior. You will be able to feel the Creator's presence in your heart and raise your energy vibration so you may be aligned to him and his Divine Will. In this workshop you are guided through deep purification processes to transmute the obstacles, attachments and other limitations which are hindering your spiritual growth and that are limiting your ability to feel the peace and joy in your heart. With your angels and spiritual guides you will learn how to resolve and transmute the contracts that your soul chose as part of its learning for this life which are currently affecting your spiritual development such as difficult relationships, situations that repeat themselves, personality traits, behaviours, limiting beliefs and physical problems. You will also heal the scars of your spiritual heart, strengthen your silver cord, recover and cleanse all the fragments of your soul, receive deep cellular and DNA healing and heal your sense of separation from mother Earth and nature. Our Akashic Records contain everything that we have done, said and thought during our current and past lifetimes. They are also known as The Book of our Lives. These sacred records are encoded in the Light to energetically preserve everything that happens in existence, including existence itself. In this workshop you receive a special attunement that will allow you to access your Akashic Records by connecting deeply through your heart. In the Akashic Records you will be able to find which are youryour soul’s contracts, including the lessons you decided to learn in this life. You will also learn how to receive guidance and clarification about your purpose, mission and other areas that will help you understand how best to continue your spiritual development. In this worship you will begin your mission of service to others through healing. You will learn how to radiate the Light of Pure Love in order to give healing to others. 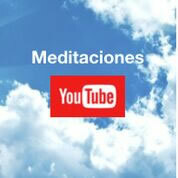 You will also learn processes that will enable you to dissolve dense energieswithin yourself, others and spaces. You will master specific healing techniques including distant healing, how to harmonise and heal chakras, how to work with quartzes and sea shells, as well as how to give healing to animals and plants. Being aligned to the Divine Will will bring us infinite joy, peace and wellbeing. It will help us fulfil our mission in this life. This online workshop will provide you with a sacred energetic opening that will help you align yourself easily to the powerful energy of the Divine Will. This energy will help you accomplish what your soul has come to this life to achieve and it will Gide you through action from your infinite self which is Pure Love. There are two mayor transitions in our lives : being born and dying. Both are part of the eternal cycle in which we exist as infinite beings. Even though both transitions are part of the natural cycle of existence, the majority of people have created barriers which prevents them from seeing them as part of their spiritual reality. This online workshop will help you understand these transition procesos in your life and prepares you to help others during these sacred moments. The attunements that you will receive during this seminar, will open energy circuits and pathways of Light that are completely new and that will allow you to offer healing at a very advanced level to people who have serious illnesses and conditions. We have received the advanced healing techniques offered in this seminar through loving blessings from Archangel Raphael, the angels of healing, the celestial medical teams and the Surgeons of Light. These beings of Light will be present during the seminar and you will be given access to Archangel Raphael's energy as well as access into the sacred healing sanctuary that brings to us a sacred and perfect Light of Pure Love. This allows us to perform healing and celestial surgery as never before. Your participation in this seminar will offer you many adjustments and transformations so that you may be ready to do the work of sacred healing with Archangel Raphael and other beings of the highest Light. This retreat is the culmination of the Paramita® Path spiritual development programme. During three days, Alba Ambert, will transmit attunements and give you specific teachings to awaken and maintain the state of enlightenment until it stabilises in your being permanently. Within months, weeks, or even days (depending on your free will) you will enjoy a stable enlightenment experience and, if you choose to remain in this state of awakening.